Founded in the 1890s by settlers from the “deep” southern states and Europe, the name comes from a park in the Carolinas. The town was granted a post office in 1895, although it closed just 8 years later. The town consisted of fifty hale and hearty souls by the mid 1890s, among these Menlowites, there was a doctor and a blacksmith. The town peaked in the early 1900s with a population of 100. 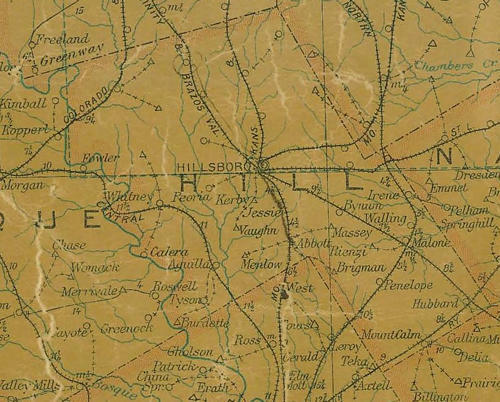 Cotton was the dominant crop for the region and since Menlow had a gin; it swelled in importance as a shipping center. Early settler Joe Steele, donated land for a school and a (Methodist) church. A school (the Treadwell School) was organized in 1920, but it was forced to merge with Abbott schools about 1940. During the Great Depression (and aftermath) the population had declined to a mere 25. The siren call of defense plants in Fort Worth and other towns sapped the strength of Menlow, and there were only 10 people left by the early 1970s. 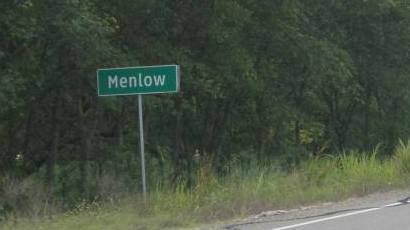 Ten remains the given population of Menlow for the 2000 census.